E-Net Pay is a quick, safe and easy process to pay or get paid online. E-Net Pay (www.enetpayment.com), a service of E-Net Payment Pvt. Ltd. which is one of the smart online payment gateways and works as an intermediary between the merchant and the shopper for purchase of merchandise online. Online Payment allows the user to process all types of online payments such as telephone or mobile top up, recharge cards, internet bill, school fees, airlines ticket, bus ticket etc. 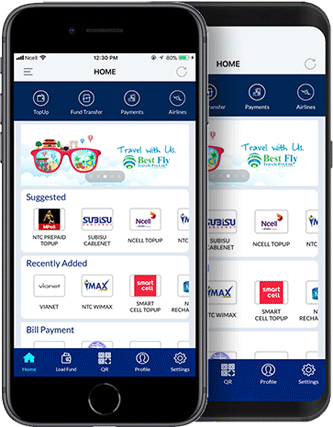 Currently, we have already signed up vendors such as NCELL, Nepal Telecom, UTL, Smart Cell, Dish Home Media, Buddha Airlines, Yeti Airlines, Simrik Airlines, Saurya Airlines, Subisu Cablenet, Broadlink, ViaNet, GME Remit, POSCASH ATM and Bussewa.com. We are working to add more vendors such as Movies Operators, Schools and Colleges, Internet Service Providers, both domestic and international airlines, Bus operators, SCT Network etc. The service allows anyone to pay in any way they prefer, including through bank accounts. Currently, we also have already created bank account such as Bank of Kathmandu Limited, Century Bank Limited, Citizens Bank Limited, Civil Bank Limited, Everest Bank Ltd., Global IME Bank, Janata Bank, Kumari Bank, Machhapuchchhre Bank, Mega Bank, Nabil Bank, NCC Bank, Nepal Bank, NIC Asia Bank, Nepal Investment Bank, NMB Bank, Prabhu Bank, Prime Bank, Rastriya Banijya Bank, Sanima Bank, Siddhartha Bank, Sunrise Bank and Lumbini Bikash Bank Limited. We are working to add more banks to make Online Payment's service quick and easy. In addition to all this, OnlinePayment will operate on an exclusive reward platform in which it will give back the fees received from vendors to the user. Hence, the user will be able to get discounts for payments to each and every service they make payments for. Enetpay is inacceasible from mobile browser. EnetPay works best if you switch to our mobile optimized app.